Flyball is an exciting sport for both dog and owner and it is a thrilling spectator sport as well. If your dog can catch and ball and is obedient and sociable with other dogs, then perhaps this is the sport for you! The sport is played in teams of four dogs and handlers with two reserve dogs plus a person to load the balls into the box. The teams play against each other in a knock out tournament until there is a winner! Each dog, in turn must race over four hurdles and then trigger a box that releases a tennis ball. The dog then goes back over the four hurdles to its handler and as it passes the finish line the next dog sets off. Time and speed is the essence of the game with the fastest team winning through to the next heat. Normally each team has three attempts to reach their fastest time. It is essential that all dogs participating must have bullet proof temperament as they are working in a fast excitable sport and are passing dogs in the opposite team very closely and at high speeds. The four hurdles are 30.9 cm (12 inches) high for all dogs regardless of size or age. The top rail is flexible and padded for safety. A backstop is also required to slow down the dogs as they race at speed. The box that dispenses the tennis balls is built to specifications laid down by the Kennel Club. A set of drawings can be obtained from the Kennel Club and built by any Flyball team member that is handy with wood and nails! Unpunctured tennis balls are used as anything smaller may lodge in the mouth and choke the dog. All dogs that participate have to wear either a harness or a smooth buckled collar so that they can be restrained. The dogs can get very excited while waiting for their turn! Flyball made its debut at Crufts in 1990 and quickly became a major part of the show not only with spectators but also with the viewing public. The running commentary and the fast dogs – sometimes with a humorous outcome – is compulsive viewing. 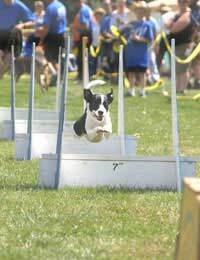 Flyball is not specific to any type of breed; any dog from any parentage may participate as long as he is a sportsman! If your dog can retrieve and catch a ball he may be suitable for flyball training. Basic obedience training is required before a dog starts his flyball training. As the dog works alone and not on a lead, it is imperative that he can follow commands and not ‘lose it’ during the excitement of the game. A dog has to be over eighteen months in order to compete, however training can start at a much earlier age. The Kennel Club can supply a list of clubs that enjoy the sport of flyball. Quite often an obedience and agility club will also have a flyball section. Contact the Kennel Club for more information.